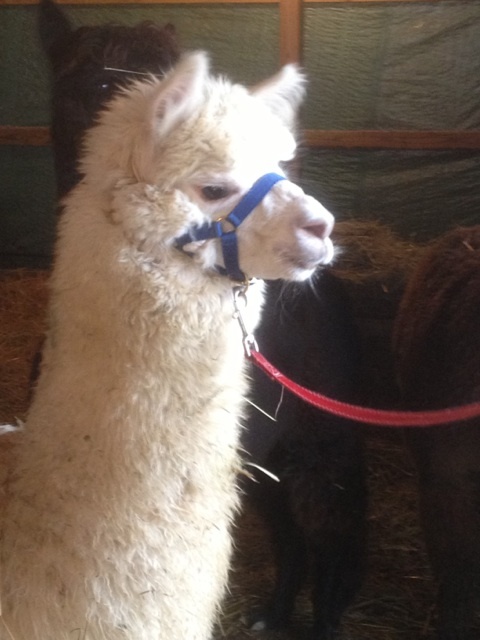 Buckeye Star Alpacas: Mango Makes Progress! Pressley came out this afternoon to work with the girls again. It was unusually warm for January; 54 degrees. 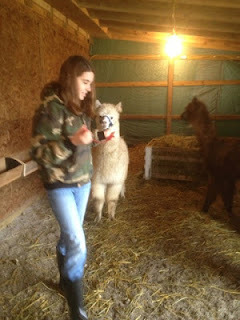 Unfortunately, because it was misty and very wet in the pasture, we had to work in the little barn. Pressley and I grabbed Mango first and haltered her. With very little initial resistance, Mango walked around the barn on the lead with Pressley in control. Mango is only eight months old and is progressing very quickly in her training. Pressley is also moving forward in her training. 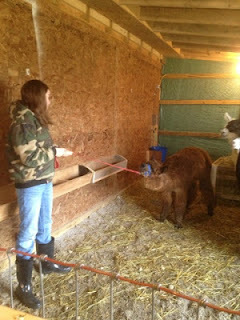 She is becoming very adept at grabbing and subduing the animals and they are responding positively to her. Leeza, on the other hand, was being extremely stubborn today. While I held Leeza, Pressley put her halter on and took over from there. 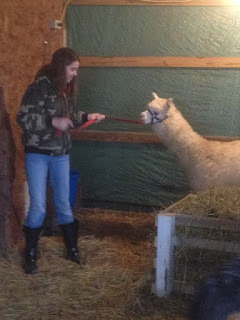 A few weeks ago, Leeza, walked around the pasture for Pressley like a champ. Today, not so much. First she put her head down, dug her heels in and would not even take the first step. No amount of coaxing could get Leeza to take a step forward and at one point she even kushed down in the straw and refused to budge. Pressley patiently kept trying to get her to move. No way. I tried to get her to take a step or two just to let her know that we weren't going to let her off the hook that easily. She needs to know that the people who feed and house her are the ones in charge. After one small step we let her go. The next nice day we will try again outside in the pasture. Maybe she feels more secure walking outside. We also held both Firenze and mama Took to do a body score on each of them. They have both been getting an extra pound of sweet feed hand fed to them each day that it is 40 degrees or less outside to help them keep up their weight during gestation. Took is staying steady at a healthy weight and Firenze has finally put on some weight and feels much less bony. It seems that Firenze's intestinal problems have finally gone away, too. Tonight I close by wishing my patient, thoughtful and handsome husband a happy anniversary!